Putin lists nuclear targets in U.S. 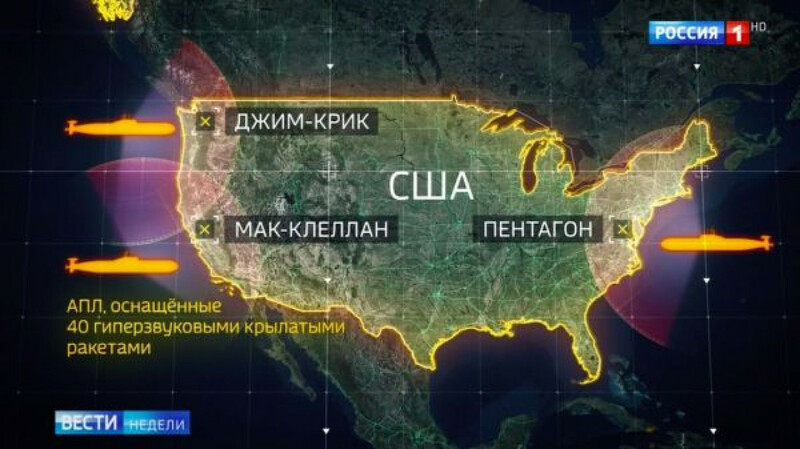 In the Sunday evening broadcast, Dmitry Kiselyov, presenter of Russia‘s main weekly TV news show ‘Vesti Nedeli’, showed a map of the United States and identified several targets he said Moscow would want to hit in the event of a nuclear war. The targets, which Kiselyov described as U.S. presidential or military command centres, also included Fort Ritchie, a military training centre in Maryland closed in 1998, McClellan, a U.S. Air Force base in California closed in 2001, and Jim Creek, a naval communications base in Washington state. NATO spokesman Pierce Casalet told the Russian news outlet RIA Novosti: “We have taken note of the message from President Vladimir Putin on February 20. The Russian declarations that threaten to attack allies are unacceptable.” Putin gave his annual State of the Nation speech yesterday and said that Russia was ready to respond to security threats. He warned Donald Trump that if he deployed intermediate-range missiles in Europe, Russia would point its weapons at US targets in Europe and on American soil. He said: “Russia will be forced to create and deploy new types of weapons that could be used not only against the territories where a direct threat to us comes from, but also against the territories where decision-making centres directing the use of missile systems threatening us are located. The announcement was in response to Trump withdrawing the US from the Intermediate Range Nuclear Forces (INF) treaty, which was signed between the US and Soviet Union in 1987. The treaty bans all ground-launched ballistic and cruise missiles with a range of about 300 to 3,500 miles. However, Trump repeatedly accused Russia of violating the treaty and finally withdrew on February 1, prompting Russia to terminate the agreement the following day. This shocking turn of events sparked fears of another arms race between the two countries. Secretary of State Mike Pompeo argued there is no point in preserving the treaty if only one party was keeping to the rules. Russia suspects the US may now place intermediate-range missiles in Europe. Similarly, NATO officials have signaled they are preparing for Russia deploying nuclear-capable missiles in Europe. Trump’s relationship with NATO has been fraught however, after he insisted the European powers are not pulling their weight. He accused many countries, including Germany, of being “delinquent” in their defence spending, adding that Germany is a “captive of Russia”. Former Assistant Secretary of Defense Larry Korb on how Russian President Vladimir Putin warned that he is ready for another Cuban Missile-style crisis if the U.S. wanted one. FOX Business Network (FBN) is a financial news channel delivering real-time information across all platforms that impact both Main Street and Wall Street. Headquartered in New York — the business capital of the world — FBN launched in October 2007 and is the leading business network on television, topping CNBC in Business Day viewers for the second consecutive year. The network is available in more than 80 million homes in all markets across the United States. Owned by FOX, FBN has bureaus in Chicago, Los Angeles, Washington, D.C. and London. Delivering his annual speech to Russian parliament Feb. 20, President Vladimir Putin promised an “asymmetric” response to the West and specifically to the United States, should Washington decide to deploy its intermediate-range nuclear weapons in Europe. The Russian leader said his country would target “decision-making centers” in the West, if the US doesn’t give credence to Moscow’s concerns. Responding to Putin’s remarks, NATO said such threats are “unacceptable. Igor Tsikhanenka has more. NATO Secretary General Jens Stoltenberg acknowledged on Tuesday that a Cold War-era nuclear treaty between the U.S. and Russia may be in its final days. Stoltenberg’s comments came after Russia’s Ministry of Defense said last Thursday that the United States should destroy its MK-41 missile defense systems deployed in Romania in order to return to compliance. Russia suspended the INF treaty earlier this month after Washington announced it would withdraw in six months unless Russia ended what it says were violations of the pact. Moscow denies flouting the treaty. Russia claims that it will and can strike USA first. A new Cuban missile crisis may be here already. Venezuela to close borders in order to stop a “regime” change and social media used to manipulate on Vaccine Propaganda topic. Russian President Vladimir Putin made bold claims that are being felt within the military community and government community after saying that Russia is militarily ready for a Cuban Missile-style crisis if the United States would like one, and that what he sees as the great nation of Russia currently has the edge when it comes to a first nuclear strike. China praised the Venezuelan government’s response to a mounting pressure that can erupt, and joined Russia in warning the United States not to step in.